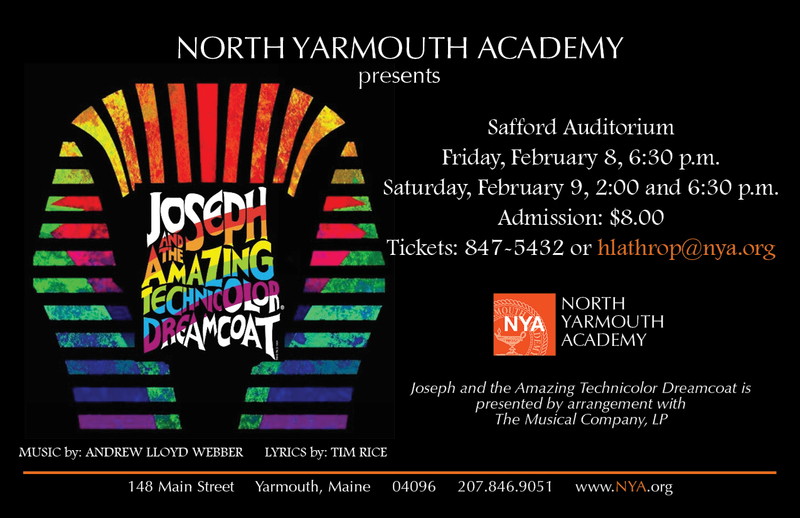 North Yarmouth Academy Drama presents Andrew Lloyd Webber’s classic musical, Joseph and the Amazing Technicolor Dreamcoat. This show, written by Webber with lyrics by Tim Rice, is based on the Genesis story of “Joseph and His Coat of Many Colors.” The musical was written in 1968, staged in amateur theaters starting in 1970, first appeared on Broadway in 1982, and was made into a movie in 1999. It is a favorite of school and community theaters, with over 20,000 different productions staged all over the world. Friday, February 8, 2019 at 6:30 p.m.
Saturday, February 9, 2019 at 2:00 p.m.
Saturday, February 9, 2019 at 6:30 p.m. The production features Jackie Ellsworth ’21 as Joseph, Madeleine Vaillancourt ’22 and Afton Morton ’20 (Narrators), Leyi Li ’22 (Jacob), Sydney Billings ’20 (Reuben), Abby King ’22 (Simeon), Justina Gilman ’22 (Levi), Emma Rothrock ‘22 (Naphtali), Alaina Rauf ’21 (Issachar), Annie Sillin ’21 (Asher), Clara Mulvihill ‘19 (Dan), Tallulah Im ’22 (Zebulun), Genevieve Vaillancourt ’25 (Gad), Celeste Merrill ‘25 (Judah), Leif MacCarthy ‘25 (Benjamin), Alex Markonish ’19 (Potiphar), Clara Mulvihill ’19 (Potiphar’s wife), Madeleine Vaillancourt ’22 (Pharaoh), Hannah Gagne ’19 (Butler), Abby King ’22 (Baker), Katie Blanc ‘20, and Lila Ojakaar ‘22, Greta Tod ‘25, Bronte Doucette ‘24, Hannah Gagne ‘19, and Alex Markonish ’19 (Wives/Egyptians). There is also a children’s choir, featuring Ivy Birney ‘27, Sidney Bouman ‘27, Cocoe Haedrich ‘26, Henry Jackson ‘26, Sarah Ludlum ‘27, Ellie Miers ‘27, Annie Millar ‘27, Ellie Sahlman ‘27, Eva Szymczak ‘28, and James Vaillancourt ‘28. The tech crew consists of Malcolm McMahon ‘21, Grace Alfiero ‘19, and Elias Eisenberg ‘22. Tickets are $8.00 and can be reserved through Heidi Lathrop (207-847-5432). All performances will be held in the Safford Center at North Yarmouth Academy, 148 Main Street, Yarmouth. There is limited seating, so make your reservations early! All shows are open to the public.